Damn! You sir, are on a winning streak… This gentleman in his shredded T-shirt and broken-in chinos simply rocks– like an image from The Sheltering Sky. Timeless. Nice picture. Looks like a JCrew catalogue spread. Nothing too special. Good use of scarf. This man is absolutely divine andthe clothes are so perfect and understated. A man that looks like this never need try too hard. Wonderful! A white tee and chinos to their best advantage. All it needs is style and a scarf! This is also such a wonderful picture, of such an attractive man. I love his curly hair and the way he combines all those soft cramy colours, the scarff, the long sleeved T-shirt and the belt. Not a fan of moustaches and shorts (those are shorts, aren’t they? ), but as for the shorts, if he’s in the beach, it’s all right. looks like a wild fisherman. Me encanta el colorido, el pelo, la piel, la ropa… es todo harmonía. Perfecto! This is the kind of laid back look im looking for. the scarf is the most important piece but notice the belt? its not buckled up.the tshirt is shredded (must be comfortable and whats more comfortable than chinos? Love it! Where can I find such a t-shirt? No one seems to make them anymore! You know I’m usually not big on scarfs, particularly when it’s not winter and when the scarf has a print on it, but he makes it look cool. I think I’m going to try that this spring. Getting me out of my fashion box, good job Sat. The glasses are also pretty good. He looks really good. Laidback and effortless but with som care. Good job. But I’m not a big fan of his glasses. I wished his frames were stronger and thicker, kinda retro looking. This is the look I aspire to but most likely will never accomplish because of man breasts, etc. But, boy, does this look good! It seems the scarf is all over the place these days. Personally, I dig it. It looks best with simple outfits, such as this one. He is H-O-T, hot. And I love the scarf. Congratulations Sart! It’s great to see more and more people of different ethnicities and complexions here. There is an ever increasing number of viewers of your blog all over the world. Greetings from Peru! Wow, Sart. Every photo taken from Hyeres that you posted seem to be excellent and on point. The Mediterranean sunset appears to give the right mood, setting and lighting for your fashion photography. Love this shot, too. This guy appears to exude an image that is a cross between an intellect and a West African musician (he reminds me of the guy from Tinariwen). Perhaps he really is an intellectual West African musician? One thing though, are those shorts or chino pants? Does he actually wear the belt that way when he’s not posing? If not, why is it that way for this photo? The pants are great. Good fit and the button-fly adds a bit of flair. The torn undershirt doesn’t work for me. Old/worn/frayed is fine, but new/pre-ripped/torn is too intentional for casual clothing. Who are these guys? The belt buckle poking out and the rip on the bottom of an otherwise clean T-shirt, sort of give this one away. This guy looks like a poser. love it! i find it hard to wear scarves without looking pretentious, but he pulls it off. I love his work, Def. a great designer. he is such a serene looking guy! Glace Vanille. French Vanilla Ice. Très cool. it seems as though you guys dont know who Haider Ackermann is..check out his label.of course he would have great style. This photo belongs somewhere – an ad for Creed cologne, perhaps. Or Ralph Lauren. Great photo! One of your best! I wonder how long is the scarf? some ideas? I have always want to buy an hermes sort of scarf and now I got the inspiration. lovely pic – beautiful colors. …and the cotton of the t shirt looks amazing. love the fact that it’s frayed at the bottom. this pic goes on the desktop! where can i get a scarf like that? I have ones that are too heavy and wintry, but a soft wrap for a neck is a fine thing any season. Any ideas? A l i c e .
i’m in love with this guy. Fantastic. The scarf makes it. Atractivo y lo que le sigue! Love the look! White ensemble is such a masculine look. Laid back yet sophisticated. isn’t he the designer? with all the beautiful leather leggings. LOVE. A striking person can make the plainest clothes look exciting. Who needs sartorial flash when you have such a wonderful head of hair? This photo makes me feel calm and refreshed…probably the same way this handsome gentlemen felt on the beach. I wonder what he was thinking/looking at when this photo was taken. And I’m all about scarves, so I absolutely LOVE his! The belt detail is what does it for me in this picture. For those of you who don’t realize, its a longer belt that he has looped back. I always wonder what to do with longer belts like this. Now i know! This man is beautiful, and beautifully dressed. Fantastic shot! what size/shape scarf do ya’ll think he’s using? and how do fold, twist?, and wrap it to look like that? Casusal & Relaxed – LOOOOOVE IT! If it were only possible to merge the aesthetics of Haider and R. Owens into one sensibility, I’d Flip. I absolutely Love the layers, mix, timeless crossover of his accessories….now if I could only grow some lush locks like his. Dang. The layout for the site is still messed up. a page of white space at the top. This guy’s really really really really cool. At the same time, he’s a real guy. Which just makes him all the more cool. The light that you are getting on your beach subjects is absolutely amazing. What time of day are you shooting on the beach? DAYUM! Sir, your command of light with the camera makes me really jealous. I’m inspired to get some khakis all of a sudden. This is an example of what the everyday man should look like. Nothing outrageously overstated (ie. minimal), yet a lot more refined and put together (not in a bad way) than what the average American man would normally wear. As much as I love the bespoke, sartorial look that largely composes your site, to me this is “style”. This man understands what is right for him. On a simple breakdown of the colors in the clothes to his skin tone, I would say this has “knowing” written all over it. Only to be added to by the scarf. These folks at Hyeres are undoubtedly cool, yet most of them are in the “biz”. Is the Sart a bit shy when he leaves home? it helps that hes BEAUTIFUL. Nice. I love the layers and the scarf… which I would steal. Even though I’m a girl. What a hottie he is. In global times successful people mostly have a rich ethnic background. Seventies-style lives ! 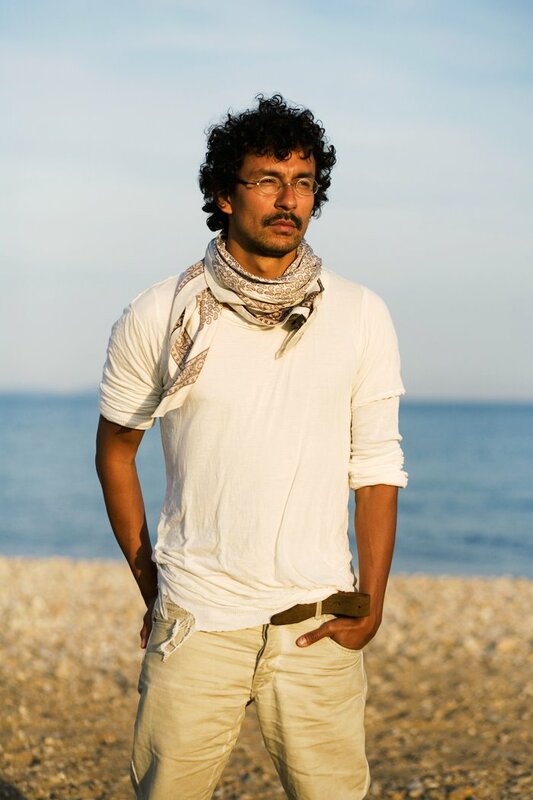 I am in love with moustaches and three-day-beards, curly black hair and glasses like this. But: wearing the belt open is bad style. he’s almost as gorgeous as his designs! and i second whomever mentioned rick owens. i never thought i’d say this, but i think i’m having a leather-fetish-moment. and thick drapey knits-fetish. it’s not even summer yet, but i can’t wait for fall if only to wear haider ackermann. i’m just hoping the leather-fetish-moment doesn’t extend far past my closet…. He’s gorgeous and the colour combination with the t-shirt and scarf is great. Absolutely nothing studied and stilted. Once again – you either have it or you don’t. Has nothing to do with money, or marketing. Please provide more of these shots. I like these photos the most when there is no agenda with them. he is the best thing that could have ever happened to fashion ……thank you haider for making such a beautiful clothes!! So good. Masculinity in fashion is all about minimalism, this is perfect, with just the right amount of flair in just the right places. Adding even a watch to this would be too much. I wish I could see what he’s done below the knee, though. he is probably the sexiest man of this whole operation! gosh! thick drapey knits-fetish. it’s not even summer yet, but i can’t wait for fall if only to wear haider ackermann. i’m just hoping the leather-fetish-moment doesn’t extend far past my closet…. When you want to take control of your life and make the most of everything around you.